Born from the creative vision of master filmmaker Zack Snyder (Watchmen, 300), Sucker Punch features an ensemble cast of young stars, including Emily Browning (The Uninvited), Abbie Cornish (Limitless), Jena Malone (Donnie Darko), Vanessa Hudgens (the High School Musical films) and Jamie Chung (Hangover 2). She has been locked away against her will, but Babydoll (Emily Browning) has not lost her will to survive. Determined to fight for her freedom, she urges four other young girls – the reluctant Sweet Pea (Abbie Cornish), the outspoken Rocket (Jena Malone), the street-smart Blondie (Vanessa Hudgens) and the fiercely loyal Amber (Jamie Chung) – to band together and try to escape a terrible fate at the hands of their captors, Blue (Oscar Isaac) and Madam Gorski (Carla Gugino), before the mysterious High Roller (Jon Hamm) comes for Babydoll. sacrifice in order to stay alive. But with the help of a Wise Man (Scott Glenn), their unbelievable journey – if they succeed – will set them free. 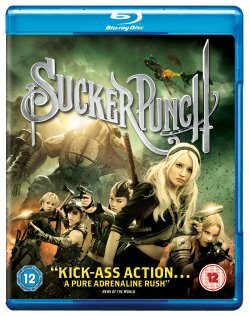 From critically acclaimed director Zack Snyder, Sucker Punch is a visually stunning and explosive suspense ride about a girl and her unbelievable journey to freedom. The Blu-Ray Combo Pack includes an action-packed Extended Cut featuring an additional 18 minutes of footage and an immersive Maximum Movie Mode hosted by director Zack Snyder. Four unique animated shorts also take you deeper into Zack Snyder’s immersive world.